Looks good for limited. It's Severed Strans with an option that allows it to not be dead in hand if you don't have a creature out. Also instant speed so you can chump and kill. I like it, but I’m not sure what deck plays it. I was wondering if they'd have a blink spell in this set. This might be the next Pauper nightmare deck; especially since Arena likely handles these like Rat Colony so that you have to spend 4 common WCs for an unlimited supply of them. T4 Island, Petitioners, Petitioners, mill 12. T6 Petitioners, Petitioners, mill 24, win. This is possible on the play, but more consistent on the draw. Reliably, I'd expect this deck to win turn 7 or 8 (not having the t4 Island for the fourth Petitioner, eat removal early). Between Pauper lacking sweepers, not being an incredibly fast format, and 1/3 for 2 being a reasonable blocker, this could get ugly. The problem is that there is a severe lack of counterplay. Rats have a bad matchup, because with the same deck size, a Petitioner trades with a rat while sometimes milling them. Petitioner mirror is won by the larger deck or the deck that gets the better draw. Any deck that cannot win by turn 7 or 8 virtually auto-loses. Thankfully, you're likely to get no more than 10 or so Petitioners in Limited, so the deck is not really a factor there, and Standard has answers aplenty between sweepers, Deputy of Detention and Ixalan's Binding. However, Arena Pauper is not headed for fun times. Sadly. P.S. : Whoever finds the pun in this post gets a cookie. Does this make it into aggressive red decks? 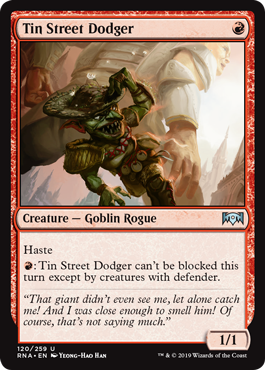 Has haste, almost never see defender in constructed so it's effectively unblockable for . 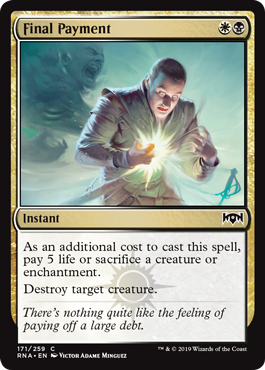 I'm thinking it's better than the 1/2 wizard for 1 that becomes a 2/2 with haste with enough instants/sorceries in graveyard, in decks that run that. 3 color decks with green are going to be easier in limited. Make that Temur counters deck I'd want to draft more possible at common. Devkarin Dissident got an upgrade. Looks like a decent bear in limited. Bear early, beefcake late. 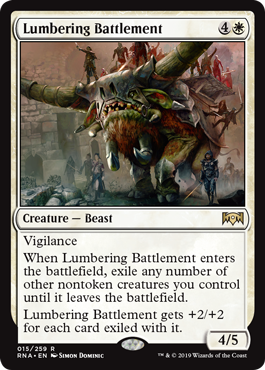 This going to make for some lethal crackback attacks in limited, when it hastes out and tramples over the chump blocks left behind. Something to keep in mind when facing GX decks in draft; have to respect the play at common. I want to build a Bant deck with this, Deputy of Detention, Repudiate/Replicate, and Quasiduplicate (12 copy effects! w00t!). Copy Deputy early to lock down the board, copy Ooze late to beat down. 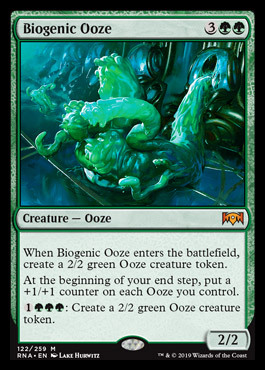 Maybe run Simic Ascendency and get that lol alt win condition to work since you're procing multiple Oozes onto a multitude of oozes each turn. dude who wouldn't want to play 5 color elves!? I was contemplating naya elves because there is a lot of little synergies there I am also looking at how to break incubation druid. Is there any word on whether they'll update other things in Arena the same time Ravnica Allegiace is released? I've got over 50 packs of cards waiting for them to address the 5th card problem before they are opened. Chuco - if you read this, plz do your Like A Boss guide for Allegiance drafting. I want to start reading people's thoughts on it. Since that doesn't exist yet and I'm dying to talk about it, I'm posting here about RNA drafting. I've been mock drafting a **** ton on draftism. On one hand, I believe it's a poor gauge of how your Arena drafts will go (the sites bots seem pretty bad), but on the other hand it's fun as hell and at least you can see how packs will look in general. 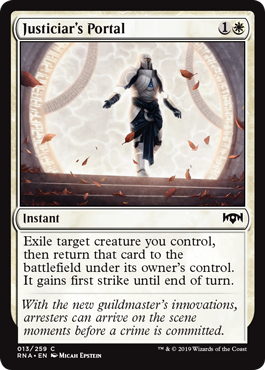 I made a post about my initial impressions of the guilds in the GRN like a boss thread, and want to expound/update after messing around on draftism more. Gruul still feels like an absolute monster. I think it'll be the best guild in limited. You get so much beef in the commons, and if you splash Jund you can get common kill spells and graveyard recursion. Splash Temur and you can unlock fliers. Riot helps you be great on the play (haste and put them on back foot) or on the draw (counter up so your doods are bigger than the doods they just played). It looks like a real beast. Azorius has taken over my impressions as the next best guild. I still think Addendum blows, but you can build some hella good looking decks. Don't sleep on High Alert. I'll revisit that later. You can splash Bant for extra beef or Esper for extra control/value grind. I think it wants Esper to be a good control build imo, but the tempo evasion game in UW looks strong. Simic has dropped a bit in my eyes. It seems like it will be really hit or miss. When it hits, I think it will hit harder than any other guild - but the stuff you really need for that is in uncommon/rare/mythic. I suspect more often than not, these builds won't be able to hang with Gruul or Azorius. If we had more ways to remove Adapt counters for value it'd be nice... 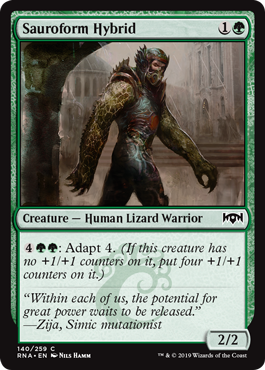 If the familiar was common like the Izzet mage that makes your spells cheaper, or even uncommon, then I'd like Adapt in limited a whole lot more. I'm ranking it middle of the pack here, with a high ceiling and low floor. Orzhov feels so damn meh. I'm so disappointed from how I thought the guild would be early in spoiler season. 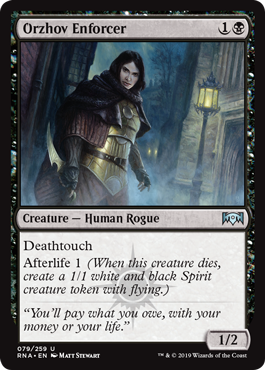 You can still build some decent decks if you get the right cards, but the common creatures are so far behind other colors doods and there are so many answers for spirits I think Afterlife will be fairly meh in limited. It looks like it'll rely more on luck (of you opps not having the right answer at the right times) than the others. Now, if you can get the right sac outlets, I think there's a strong aristocrats deck there, but I don't think it'll be easy to get those. Again, feels like it'll rely more on luck. I think you'll want to go grindy Mardu or grindy Esper. I think there's a strong deck that will use the 3 mana red spell that gives 2+ goblins (if you can draft 3 of those or more I think you're happy) plus aristocrats to churn out value on top of the Afterlife tokens. At first I thought the spirits would be great attackers, but after seeing how many fliers are in packs (and ways to deal with them/Afterlife in general) I'm thinking those spirits will be best as sac fodder. I'm still having trouble figuring out Rakdos. The traditional aggro version is hard to build. Doable, but more often it wants to be a grindy build that continually pings small amounts of damage. Captive Audience is like the ideal top end for how grindy and slow my draft pools tend to look when I get into Rakdos. Similar to Izzet in GRN, this guild has two very different archetypes it wants to make and there's a risk you'll end up with a schizophrenic pool that doesn't do either very well. Lastly on the guilds, I think a gates deck is more viable this set. 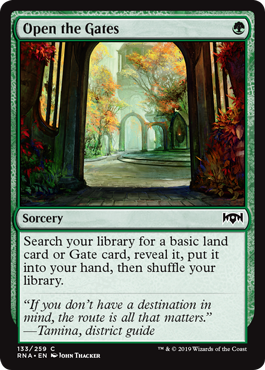 The gates matter cards are decent to super good. 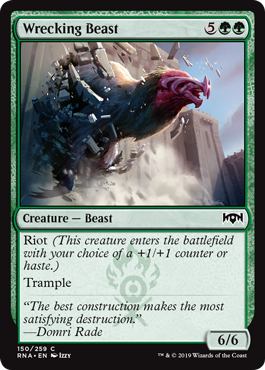 In particular the green 3 mana creature that pumps for each guild in play and gains vigilance + trample with at least 2 looks stronk. I'm happy to run that in any GX deck I draft with at least 2 gates, and my happiness increases exponentially with each gate after. Couple that with the red X sweeper and you can build a strong deck if bots are passing gates matter stuff over to you. Wish they would put the damn things in Gatherer already.